Selling to emerging markets is exciting, but it can be risky if you don't have the right sales leads. This Qatar email database is the email address list you need to reach executives and decision-makers in this Persian Gulf country. If your business is interested in selling to global markets, then you need to look into Qatar. You can get a Qatar mailing list here that has the accurate email leads you need to sell to key points of contact at businesses in Qatar. We will provide you with the business contact list you need to drive revenue and grow your B2B contacts in the Persian Gulf. It is never easy selling in a new market, but you can make the process easier with a bulk email list from us. 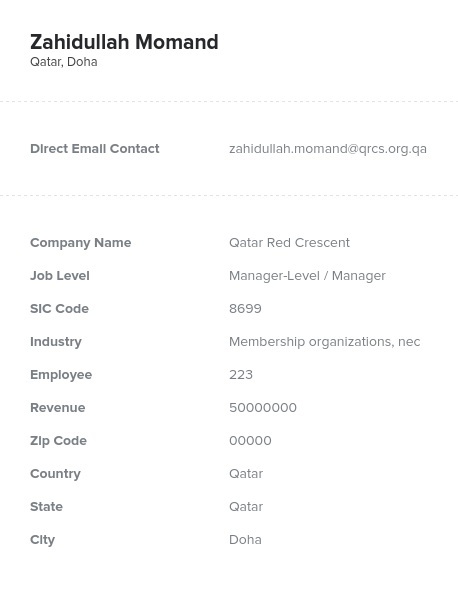 You can buy a pre-built, human-verified Qatar email list from us that is loaded with names, email addresses, phone numbers, and more. We also offer a list-building tool that can help you develop your own Qatar email database full of accurate and updated information. We will get you the targeted email list you need, no matter what type of client you need to talk to in Qatar. If your goal is to find business success in Qatar, then your first step is to invest in a Qatar mailing list here. Get this Qatar email database for your sales team today and get your marketing message seen by your target audience.